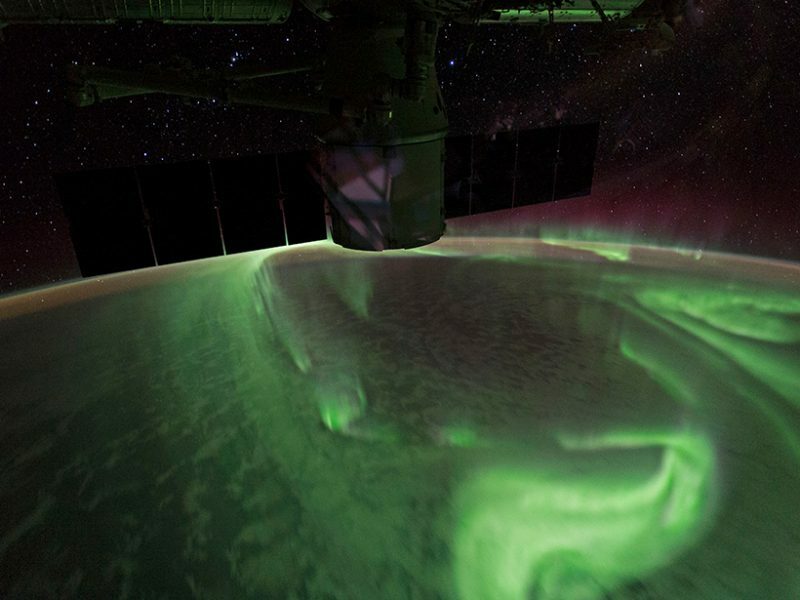 The most spectacular auroras are produced by electrons zipping from space into Earth’s atmosphere. Although Earth’s magnetic field repels most electrons before they reach any wisps of air, under special conditions they can penetrate into the atmosphere, striking air molecules and causing them to glow. But how exactly those electrons, which normally circulate in Earth’s magnetic field, are accelerated or pushed down into the atmosphere is not fully clear. It’s generally agreed that there are three main ways to generate this “auroral precipitation.” One is small pockets of strong electric field high above Earth—also known as quasi-static potential structures (QSPS)—which can whisk them down. Another is strong waves in Earth’s magnetic field in which field lines vibrate like a plucked string—called Alfvén waves—propelling the charged particles along. These two mechanisms produce the most intense bands, curtains, and sheets of auroras. The other main cause is higher-frequency waves in Earth’s magnetic field that don’t increase electrons’ speed but scatter them, nudging the particles into trajectories that carry them down into the atmosphere. Wave scattering produces a less vivid, diffuse auroral glow but is commonly thought to be responsible for the bulk of the total auroral energy. But it’s difficult to decipher which of these three is happening at any given time. They can be identified only indirectly by analyzing spacecraft data measurements. Plus, these different mechanisms can occur simultaneously, which researchers have been unable to disentangle. Now, Dombeck et al. [JGR Space Physics] have developed a classification scheme that resolves many of these ambiguities and can detect multiple mechanisms. Their method used 13 years of data from NASA’s Fast Auroral Snapshot Explorer (FAST), a satellite launched into Earth orbit in 1996. Crucially, its instruments can observe electrons traveling both down toward Earth and up into space. In contrast, the previous, widely used scheme was based on data from satellites that could measure only downward traveling electrons and could identify only a single mechanism at a time. Being able to see upward traveling electrons makes it easier to determine whether they were accelerated by electric field structures or magnetic field vibrations, as the former reflect upgoing electrons back toward Earth and the latter do not. When the team compared their results, they found that misclassifications were common under the previous scheme. Applying their method to FAST data paints a complex picture of electron precipitation: Most of the time, multiple mechanisms contribute, and frequently, all three appear in intense auroral storms. Intriguingly, their results may also contradict the view that wave scattering contributes most of the energy of electron precipitation: The authors found that on Earth’s nightside, two thirds of the energy input comes from intense precipitation that is mostly caused by QSPS and Alfvén waves. Using this new method to better understand the mechanisms responsible for auroral precipitation will also help scientists better understand how Earth’s magnetic fields interact with the stream of charged particles coming from the Sun and how this interaction produces hazardous solar storms. The first image of a black hole ever taken was released April 10, 2019. This monumental achievement was made possible, in part, by key leadership and funding from the Center for Astrophysics | Harvard & Smithsonian (CfA). The Event Horizon Telescope, or EHT, is a global array of radio telescopes involving dozens of institutions and hundreds of scientists. The breakthrough discovery by the EHT is an image of Messier 87’s (M87’s) supermassive black hole in the center of the Virgo galaxy cluster, 55 million light years away. This black hole contains 6.5 billion times the mass of our Sun. Six papers are being published in the Astrophysical Journal Letters [see link below] today to describe this groundbreaking result. Black holes are extremely compressed cosmic objects, containing extraordinary amounts of mass within a tiny region. This mass is shrouded by an event horizon, that is, the boundary beyond which nothing – not even light – can escape from the black hole’s powerful gravitational pull. The presence of these objects affects their surroundings in extreme ways, including warping spacetime and heating surrounding material to hundreds of billions of degrees. General Relativity predicts that a black hole will cast a circular shadow upon this bright, glowing material. The newly released image of M87 from the EHT reveals this shadow. After separately recording the signals at all eight telescopes, the data are flown to [two] locations* to be computationally combined into what would be measured by an Earth-sized telescope. *MIT Haystack Observatory, Westford, Massachusetts, USA and Max Planck Institute for Radio Astronomy Bonn Germany. 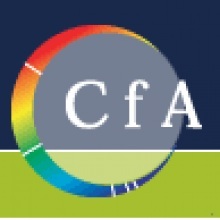 Besides those listed above, many others at the CfA have contributed in countless and invaluable ways. The following CfA scientists and engineers are co-authors of all six of the papers: Mislav Baloković, Lindy Blackburn, Katie Bouman, Roger Brissenden, Andrew Chael, Shep Doeleman, Joseph Farah, Mark Gurwell, David James, Michael Johnson, Garrett Keating, Jim Moran, Ramesh Narayan, Daniel Palumbo, Nimesh Patel, Dominic Pesce, Alexander W. Raymond, Jonathan Weintroub, Maciek Wielgus, and Ken Young. A list of biographies for CfA scientists working on the EHT are located here. The EHT and many of its key scientists are funded by a mixture of public (i.e. 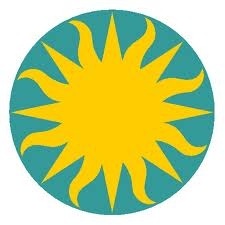 taxpayer) sources such as the National Science Foundation (NSF) and the Smithsonian Institution (SI) as well as the generosity of private entities including the Templeton Foundation and the Gordon and Betty Moore Foundation (GBMF). The NSF has funded steady advancement of the EHT over more than a decade and SI, administered through SAO, has provided funding for seven years. Doeleman has grants from the NSF and also from the GBMF and the John Templeton Foundation. The GBMF funded key technical developments starting in 2012 and was foundational in building the SAO group. SAO is one of the 13 stakeholder institutes for the EHT Board, and the CfA hosts the Array Operations Center for EHT observations. The SMA is a joint project between the Smithsonian Institution and the Academia Sinica Institute of Astronomy and Astrophysics (ASIAA) in Taiwan. The Greenland Telescope, funded by ASIAA and SAO, joined the EHT for its second observing run in April, 2018. For more information on the EHT and this groundbreaking result, visit http://www.eventhorizontelescope.org and follow @ehtelescope on social media. The website for the CfA, which is organized into six research divisions to study the origin, evolution, and ultimate fate of the Universe, is http://www.cfa.harvard.edu. Katie Bouman takes the story to Caltech. Scientists in the VERITAS (Very Energetic Radiation Imaging Telescope Array System) Collaboration have published a paper in Nature Astronomy journal detailing the results of their work with the VERITAS array—located at the Center for Astrophysics’ Fred Lawrence Whipple Observatory in Amado, Arizona—to measure the smallest apparent size of stars in the night sky known to date. At its conclusion, the pilot study resulted in the direct measurement of the size of a star at the smallest angular scale in the night sky to date, and established a new method to determine the angular diameter of stars. VERITAS (Very Energetic Radiation Imaging Telescope Array System) is a ground-based array of four, 12-m optical reflectors for gamma-ray astronomy located at the Center for Astrophysics | Harvard & Smithsonian, Fred Lawrence Whipple Observatory in Amado, Arizona. VERITAS is the world’s most sensitive very-high-energy gamma-ray observatory, and it detects gamma rays via the extremely brief flashes of blue “Cherenkov” light they create when they are absorbed in the Earth’s atmosphere. VERITAS is supported by grants from the U.S. Department of Energy Office of Science, the U.S. National Science Foundation, and the Smithsonian Institution, and by NSERC in Canada. 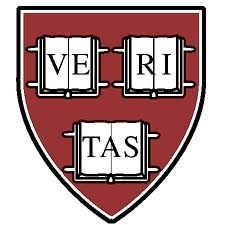 The VERITAS Collaboration consists of about 80 scientists from 20 institutions in the United States, Canada, Germany and Ireland. DESY is one of the world’s leading particle accelerator centers. Researchers use the large‐scale facilities at DESY to explore the microcosm in all its variety – ranging from the interaction of tiny elementary particles to the behavior of innovative nanomaterials and the vital processes that take place between biomolecules to the great mysteries of the universe. The accelerators and detectors that DESY develops and builds at its locations in Hamburg and Zeuthen are unique research tools. DESY is a member of the Helmholtz Association, and receives its funding from the German Federal Ministry of Education and Research (BMBF) (90 per cent) and the German federal states of Hamburg and Brandenburg (10 per cent). Research on 144 countries reveals opportunities and pitfalls of this fast-growing sector. 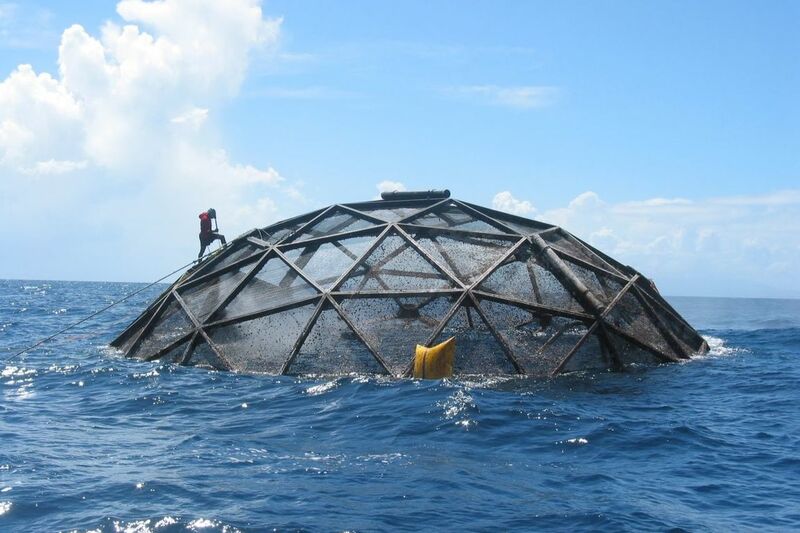 Divers survey submersible cages used to farm cobia off the coast of Puerto Rico. UCLA researchers conducted the first country-by-country evaluation of the potential for marine aquaculture under current policies and practices. NOAA. Seafood farming in the ocean — or marine aquaculture — is the fastest growing sector of the global food system, and it shows no sign of slowing. Open-ocean farms have vast space for expansion, and consumer demand continues to rise. As with many young industries, there’s a lot to figure out, from underlying science and engineering to investment and regulations. In a study published in the journal Marine Policy, UCLA researchers report that they have conducted the first country-by-country evaluation of the potential for marine aquaculture under current governance, policy and capital patterns. They discovered a patchwork of opportunities and pitfalls. Peter Kareiva, one of the study’s authors and director of the UCLA Institute of the Environment and Sustainability, said sustainable food systems are an important part of the fight against climate change. In 2017, Kareiva’s research found that a tiny fraction of the world’s oceans, farmed sustainably — just 0.015 percent — could satisfy the entire world’s fish demand. The new study categorizes 144 countries into three groups based on their capacity for aquaculture growth in the industry: “goldilocks,” “potential at-risk” and “non-optimized producer.” The categories are based on quality of government institutions and regulations, potential for investment and how suitable the biological and physical environment are for farming seafood in the ocean. Sixty-seven countries fell in the goldilocks category for either finfish or bivalves, like mussels and clams — meaning conditions there are favorable for marine aquaculture. 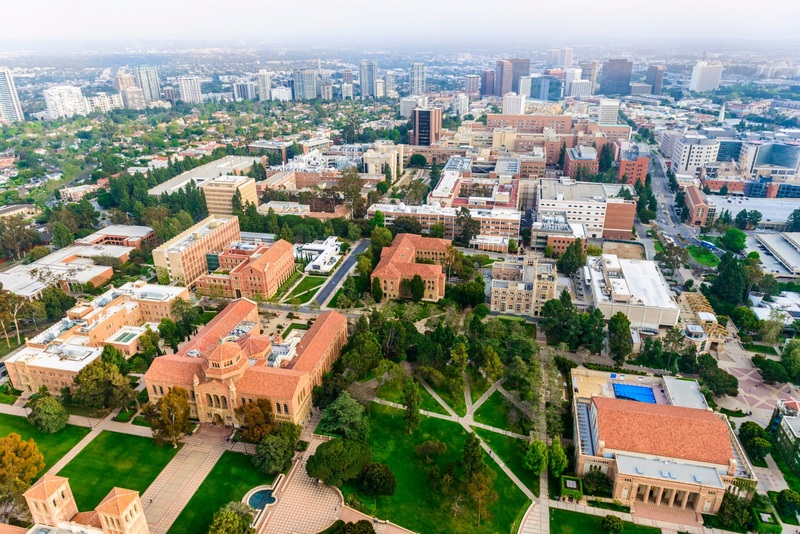 According to lead author Ian Davies, who conducted research for the study at Kareiva’s UCLA lab, the industry could help address social challenges in these places. Twenty-four countries were identified as non-optimized producers, which lack highly productive waters but still engage in aquaculture, usually because of better access to investment. This group includes countries around the Persian Gulf and Black Sea, South Korea, Italy, Canada and Norway. Finally, the paper categorized 77 countries as potential at-risk. These countries have suitable waters but poor access to capital and unstable, corrupt or ineffective governance systems. Despite such problems, 16 are currently farming fish in the ocean, often harming ecosystems or causing other problems in the process. China is by far the largest producer of ocean-farmed seafood, owing to strong financial capacity and political will, but was found to have poor oversight — which could pose problems for the industry in the future. Ineffective regulation often leads to ecosystem damage. In the 1990s, there was a shrimp farming boom in Southeast Asia. Operations added too much shrimp and feed to mangroves, destroying many in the process. The impact was also felt by humans. Mangroves serve as barriers that reduce storm surge and flooding, and many small aquaculture operators quickly found themselves out of business. More recently, unregulated fish farming led to disease outbreaks in northern Vietnamese waters. In other observations, the study found that while lack of regulation poses problems, so can regulation that is too burdensome. In Ireland the licensing process takes years, making it impossible for operators to qualify for European Union grants. There are other country-specific barriers, too. New Zealand is a goldilocks country, but opposition from local communities and vocal stakeholders, including fishermen, has slowed marine development. China is the largest marine aquaculture producer by far, but its waters are only moderately good and its governance was listed as low quality. The industry has succeeded there because of political will and access to capital. China isn’t alone. Excluding outliers, the study notes, less suitable countries produce almost six times as much fish as optimal countries. Capital-driven aquaculture in less suitable waters carries the risk of being less effective and more damaging. Marine aquaculture is seen as promising compared to high-polluting inland operations. The open ocean disperses its impact, leading to fewer environmental problems. Meanwhile, according to the United Nations, nearly 90 percent of the world’s marine stocks are depleted, with many fisheries on the verge of collapse. Sustainably farming oceans could allow wild populations to rebound while serving as a crucial source of protein and economic benefits to humans. Scientists have observed the clearest evidence yet of an incredibly rare and exotic theoretical phase of matter called a supersolid – and while it only lasted experimentally for a fleeting instant in the lab, it’s the longest we’ve ever glimpsed such paradoxical strangeness to exist at all. Supersolids were first theoretically predicted to exist a half-century ago, fusing both the rigid characteristics of solids and the flowing characteristics of liquids at the atomic level. What this means is that somehow, as impossible as it sounds, the atoms that make up these strange supersolid materials are spatially arranged in such a way that they resemble a crystalline structure, while simultaneously embodying the liquid-like properties of superfluidity. Scientists have been studying supersolid matter for decades, both theoretically but also experimentally, trying to replicate and somehow observe them in the real world, mostly in experiments with an isotope of helium called superfluid helium-4. However, despite many attempts – including a purported breakthrough in 2004 – firm proof for a helium-based supersolid still remains elusive. But there’s another way of potentially tricking supersolids into existence, with more recent attempts centred around ultra-cold quantum gases such as Bose–Einstein condensates (BECs). In these condensates, particles that make up the gas become so cold, they begin to show supersolid behaviour. “Recent experiments have revealed that such gases exhibit fundamental similarities with superfluid helium,” says experimental physicist Lauriane Chomaz from the University of Innsbruck in Austria, the first author of a new paper on this research. In the new experiments, Chomaz and fellow researchers worked with two such quantum gases, producing BECs of isotopes of erbium (erbium-166) and dysprosium (dysprosium-164). Both of these gases are remarkable for featuring strong dipolar interactions, which, when tweaked sufficiently by ultra-cold temperatures, promotes atomic grouping into ‘droplet’ formations that themselves promote supersolidity. “For several years, researchers have known these BECs have the ingredients for supersolidity,” quantum researcher Tobias Donner from ETH Zürich, who wasn’t involved with the study, explains in a Physics overview piece. Although erbium-166 and dysprosium-164 are both good candidates for inducing supersolid behaviour, the team’s results showed the two gases are not equal. In the experiments with the erbium isotope, the supersolid state observed was “only transient”, senior researcher Francesca Ferlaino explains; in contrast, the dysprosium BEC demonstrated “unprecedented stability” for a supersolid. “Reaching the phases via a slow interaction tuning, starting from a stable condensate, we observe that erbium-166 and dysprosium-164 exhibit a striking difference in the lifetime of the supersolid properties, due to the different atom loss rates in the two systems,” the authors write in their paper. Of course, 150 milliseconds might not seem very long to you and me, but for an incredibly exotic and quasi-impossible phase of matter that has to be coaxed into existence to be seen at all, it’s actually “remarkably long-lived”, to quote the research team. Despite that long life, the researchers stop short of proclaiming these results offer the unambiguous proof of supersolidity we’ve been looking for, describing the work as “evidence for hallmarks of this exotic state in ultracold dilute atomic gases”. That said, it’s clear we’re edging ever closer to even more exciting breakthroughs, especially since this research follows close on the heels of two other very recent experiments [Physical Review X] [Physical Review Letters] honing in on supersolid states in dipolar quantum gases. For solid proof of the supersolid, it may only be a matter of time. The findings are reported in Physical Review X. Scientists are excited by the prospect of stripping catalysts down to single atoms. Attached by the millions to a supporting surface, they could offer the ultimate in speed and specificity. Now researchers have taken an important step toward understanding single-atom catalysts by deliberately tweaking how they’re attached to the surfaces that support them – in this case the surfaces of nanoparticles. They attached one platinum atom to each nanoparticle and observed how changing the chemistry of the particle’s surface and the nature of the attachment affected how keen the atom was to catalyze reactions. Key experiments for the study took place at the Department of Energy’s SLAC National Accelerator Laboratory, and the results were reported in Nature Materials yesterday. “We believe this is the first time the reactivity of a metallic single-atom catalyst has been traced to a specific way of attaching it to a particular supporting structure. This study is also unique in systematically controlling that attachment,” said Simon R. Bare, a distinguished staff scientist at SLAC’s Stanford Synchrotron Radiation Lightsource (SSRL) and a co-author of the study. Bare and other SLAC scientists were part of a previous study at SSRL [Nature Catalysis] that found that individual iridium atoms could catalyze a particular reaction up to 25 times more efficiently than the iridium nanoparticles used today, which contain 50 to 100 atoms. This latest study was led by Associate Professor Phillip Christopher of the University of California, Santa Barbara. It looked at individual atoms of platinum that were attached to separate nanoparticles of titanium dioxide in his lab. While this approach would probably not be practical in a chemical plant or in your car’s catalytic converter, it did give the research team exquisitely fine control of where the atoms were placed and of the environment immediately around them, Bare said. Researchers gave the nanoparticles chemical treatments – either harsh or mild – and used SSRL’s X-rays to observe how those treatments changed where and how the platinum atoms attached to the surface. Meanwhile, scientists at the University of California, Irvine directly observed the attachments and positions of the platinum atoms with electron microscopes, and researchers at UC-Santa Barbara measured how active the platinum atoms were in catalyzing reactions. A platinum atom has six binding sites where it can hook up with other atoms. In untreated nanoparticles, the atoms were buried in the surface and firmly bound to six oxygen atoms each; they had no free binding sites that could grab other atoms and start a catalytic reaction. In mildly treated particles, the platinum atoms emerged from the surface and were bound to just four oxygen atoms apiece, leaving them two free binding sites and the potential for more catalytic activity. And in harshly treated particles, the atoms clung to the surface by only two bonds, leaving four binding sites free. When the researchers tested the ability of the variously treated nanoparticles to catalyze a reaction where carbon monoxide combines with oxygen to form carbon dioxide – the same reaction that takes place in a car’s catalytic converter – this one came out on top, Bare said, with five times greater activity than the others. SSRL is a DOE Office of Science user facility. The changing positions of the platinum atoms on the particle surfaces were imaged and observed with transmission electron microscopy using state-of-the-art facilities recently established at the Irvine Materials Research Institute (IMRI) at UC-Irvine. Detailed experimental insights obtained in the study were correlated with predictions made by theorists at the University of Milano-Bicocca in Italy. The faint seismic signal, detected by the lander’s Seismic Experiment for Interior Structure (SEIS) instrument, was recorded on April 6, the lander’s 128th Martian day, or sol. This is the first recorded trembling that appears to have come from inside the planet, as opposed to being caused by forces above the surface, such as wind. Scientists still are examining the data to determine the exact cause of the signal. The new seismic event was too small to provide solid data on the Martian interior, which is one of InSight’s main objectives. The Martian surface is extremely quiet, allowing SEIS, InSight’s specially designed seismometer, to pick up faint rumbles. In contrast, Earth’s surface is quivering constantly from seismic noise created by oceans and weather. An event of this size in Southern California would be lost among dozens of tiny crackles that occur every day. “The Martian Sol 128 event is exciting because its size and longer duration fit the profile of moonquakes detected on the lunar surface during the Apollo missions,” said Lori Glaze, Planetary Science Division director at NASA Headquarters. NASA’s Apollo astronauts installed five seismometers that measured thousands of quakes while operating on the Moon between 1969 and 1977, revealing seismic activity on the Moon. Different materials can change the speed of seismic waves or reflect them, allowing scientists to use these waves to learn about the interior of the Moon and model its formation. NASA currently is planning to return astronauts to the Moon by 2024, laying the foundation that will eventually enable human exploration of Mars. InSight’s seismometer, which the lander placed on the planet’s surface on Dec. 19, 2018, will enable scientists to gather similar data about Mars. By studying the deep interior of Mars, they hope to learn how other rocky worlds, including Earth and the Moon, formed. This set of images from the Instrument Deployment Camera shows NASA’s InSight lander placing its first instrument onto the surface of Mars, completing a major mission milestone. Image Credit: NASA/JPL-Caltech. Three other seismic signals occurred on March 14 (Sol 105), April 10 (Sol 132) and April 11 (Sol 133). Detected by SEIS’ more sensitive Very Broad Band sensors, these signals were even smaller than the Sol 128 event and more ambiguous in origin. The team will continue to study these events to try to determine their cause. Regardless of its cause, the Sol 128 signal is an exciting milestone for the team. Most people are familiar with quakes on Earth, which occur on faults created by the motion of tectonic plates. Mars and the Moon do not have tectonic plates, but they still experience quakes – in their cases, caused by a continual process of cooling and contraction that creates stress. This stress builds over time, until it is strong enough to break the crust, causing a quake. Detecting these tiny quakes required a huge feat of engineering. On Earth, high-quality seismometers often are sealed in underground vaults to isolate them from changes in temperature and weather. InSight’s instrument has several ingenious insulating barriers, including a cover built by JPL called the Wind and Thermal Shield, to protect it from the planet’s extreme temperature changes and high winds. SEIS has surpassed the team’s expectations in terms of its sensitivity. The instrument was provided for InSight by the French space agency, Centre National d’Études Spatiales (CNES), while these first seismic events were identified by InSight’s Marsquake Service team, led by the Swiss Federal Institute of Technology. “We are delighted about this first achievement and are eager to make many similar measurements with SEIS in the years to come,” said Charles Yana, SEIS mission operations manager at CNES. A number of European partners, including CNES and the German Aerospace Center (DLR), support the InSight mission. CNES provided the SEIS instrument to NASA, with the principal investigator at IPGP. Significant contributions for SEIS came from IPGP; the Max Planck Institute for Solar System Research in Germany; the Swiss Federal Institute of Technology (ETH Zurich) in Switzerland; Imperial College London and Oxford University in the United Kingdom; and JPL. DLR provided the Heat Flow and Physical Properties Package (HP3) instrument, with significant contributions from the Space Research Center of the Polish Academy of Sciences and Astronika in Poland. Spain’s Centro de Astrobiología supplied the temperature and wind sensors. Jet Propulsion Laboratory (JPL)) is a federally funded research and development center and NASA field center located in the San Gabriel Valley area of Los Angeles County, California, United States. Although the facility has a Pasadena postal address, it is actually headquartered in the city of La Cañada Flintridge, on the northwest border of Pasadena. JPL is managed by the nearby California Institute of Technology (Caltech) for the National Aeronautics and Space Administration. The Laboratory’s primary function is the construction and operation of robotic planetary spacecraft, though it also conducts Earth-orbit and astronomy missions. It is also responsible for operating NASA’s Deep Space Network. The Milky Way, as seen by the Gaia satellite. Streams of co-moving stars are shown colored according to their motions as measured by Gaia. The “Fimbulthul” stream which is due to stars lost from the omega Centauri globular cluster (white box) has been highlighted. Credit R. Ibata. A team of researchers from the Strasbourg Astronomical Observatory, Bologna Observatory and the University of Stockholm has identified a stream of stars that was torn off the globular cluster Omega Centauri. Searching through the 1.7 billion stars observed by the ESA Gaia mission, they have identified 309 stars that suggest that this globular cluster may actually be the remnant of a dwarf galaxy that is being torn apart by the gravitational forces of our Galaxy. In 1677, Edmond Halley gave the name “Omega Centauri” (ω Cen) to what he thought was a star in the Centaurus constellation. Later in 1830 John Herschel realized that it was in fact a globular cluster that could be resolved into individual stars. We now know that Omega Centauri is the most massive globular cluster in the Milky Way: it is about 18,000 light years from us and contains several million stars that are about 12 billion years old. The nature of this object has been the subject of much debate: is it really a globular cluster, or could it be the heart of a dwarf galaxy whose periphery has been dispersed by the Milky Way? This last hypothesis is based on the fact that ω Cen contains several stellar populations, with a large range of metallicities (i.e. heavy element content) that betray a formation over an extended period of time. An additional argument in favor of this hypothesis would be to find debris from the cluster scattered along its orbit in the Milky Way. Indeed, when a dwarf galaxy interacts with a massive galaxy like our own, stars are torn off by gravitational tidal forces, and these stars remain visible for a time as stellar streams, before becoming dispersed in the vast volumes of interstellar space surrounding the massive galaxy. By analyzing the motions of stars measured by the Gaia satellite with an algorithm called STREAMFINDER developed by the team, the researchers identified several star streams. One of them, named “Fimbulthul” (after one of the rivers in Norse mythology that existed at the beginning of the world), contains 309 stars stretching over 18° in the sky. By modeling the trajectories of the stars, the team showed that the Fimbulthul structure is a stellar tidal stream torn off ω Cen, extending up to 28° from the cluster. Spectroscopic observations of 5 stars of this stream with the Canada-France Hawaii Telescope show that their velocities are very similar, and that they have metallicities comparable to the stars of ω Cen itself, which reinforces the idea that the tidal stream is linked to ω Cen. The researchers were then able to show that the stream is also present in the very crowded area of sky in the immediate vicinity of the cluster. Further modeling of the tidal stream will constrain the dynamical history of the dwarf galaxy that was the progenitor of ω Cen, and allow us to find even more stars lost by this system into the halo of the Milky Way. The team’s paper appeared in the April 22nd edition of Nature. The CFH observatory hosts a world-class, 3.6 meter optical/infrared telescope. 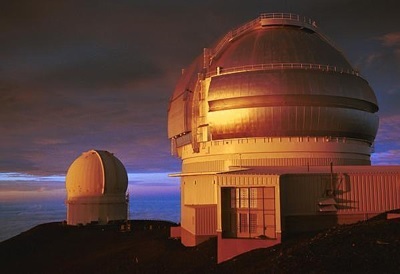 The observatory is located atop the summit of Mauna Kea, a 4200 meter, dormant volcano located on the island of Hawaii. The CFH Telescope became operational in 1979. The mission of CFHT is to provide for its user community a versatile and state-of-the-art astronomical observing facility which is well matched to the scientific goals of that community and which fully exploits the potential of the Mauna Kea site. Tags: Basic Research ( 10,460 ), Chemistry ( 430 ), GREAT-The proof was obtained using the German Receiver for Astronomy at Terahertz Frequencies a far-infrared spectrometer carried on board SOFIA, NASA/DLR SOFIA ( 14 ), The helium hydride ion to give HeH+ its full name once posed something of a dilemma for science. Airborne observatory brings the long search to a successful conclusion. The early development of the Universe would have been impossible without a small ion known as HeH+. Previously, scientists had been unable to detect this ion in space. Thanks to the GREAT far-infrared spectrometer on board the SOFIA airborne observatory, an international team of researchers has now succeeded in obtaining proof of its presence. The helium hydride ion, to give HeH+ its full name, once posed something of a dilemma for science. Although its existence has been known from laboratory studies for almost 100 years, it had not been found in space, despite extensive searches. As a result, the chemical model calculations associated with it were called into question. But an international team of researchers led by Rolf Güsten of the Max Planck Institute for Radio Astronomy in Bonn has now succeeded in clearly detecting this ion in the direction of the planetary nebula NGC 7027. NGC 7027. William B. Latter (SIRTF Science Center/Caltech) and NASA. The proof was obtained using the German Receiver for Astronomy at Terahertz Frequencies (GREAT) [image below], a far-infrared spectrometer carried on board the Stratospheric Observatory for Infrared Astronomy (SOFIA). SOFIA is a joint project by the German Aerospace Center (Deutsches Zentrum für Luft- und Raumfahrt; DLR) and NASA, the US space agency. The results were published in the 18 April 2019 issue of the scientific journal Nature. “Over the last decade, people have had great hopes for space observatories such as Spitzer (NASA, launched 2003) and Herschel (ESA, launched 2009), but none of these telescopes were able to detect this ion. SOFIA has provided us with proof that this ion really can form in planetary nebulae. At present, there is no other telescope capable of observing at these wavelengths, so this observation platform will remain unique for many years to come,” says Anke Pagels-Kerp, Head of the Space Science Department at the DLR Space Administration in Bonn. In the late 1970s, astrochemical models suggested that a detectable quantity of HeH+ might be present within nebulae in the Milky Way. It was thought most likely to be found in what are known as planetary nebulae, which are shells of gas and dust that have been ejected from a Sun-like star in the last phase of their lifecycle. The high-energy radiation generated by the central star drives ionisation fronts into the envelope of ejected material. According to the model calculations, it is precisely here that the HeH+ ions are supposed to form. Yet despite its undisputed importance in the history of the early Universe, it had long proven impossible to find the HeH+ ion in interstellar space. Although it has been known to exist since 1925, specific searches for it in space have been unsuccessful over recent decades. The molecule emits its strongest spectral line at a characteristic wavelength of 149.1 micrometres (corresponding to a frequency of 2.01 terahertz). Earth’s atmosphere blocks all radiation in this wavelength range, preventing searches by ground-based observatories; therefore, the search must be conducted either from space or using high-flying observatories such as SOFIA. At an altitude of 13 to 14 kilometres, SOFIA operates above the absorbing layers of the lower atmosphere. “SOFIA offers a unique opportunity to use the very latest technologies at any given time. The ongoing German-led development of the GREAT instrument has now made the detection of helium hydride possible. This underlines the importance of such instruments and the potential that their development holds for SOFIA in future,” explains Heinz Hammes, SOFIA Project Manager at the DLR Space Administration. The HeH+ ion is very important by virtue of its role in the formation of the Universe; all chemistry began approximately 300,000 years after the Big Bang. Although the Universe was still in its early stages, the temperature had already fallen to under approximately 3700 degrees Celsius. The elements that formed in the Big Bang – such as hydrogen, helium, deuterium and traces of lithium – were ionised at first, due to the high temperatures. As the Universe cooled, they recombined with free electrons to create the first neutral atoms. This happened first with helium. At this point, hydrogen was still ionised and was present in the form of free protons, or hydrogen nuclei. These combined with the helium atoms to form the helium hydride ion HeH+, making it one of the very first molecular compounds in the Universe. As recombination advanced, HeH+ reacted with the newly-formed neutral hydrogen atoms, thus paving the way for the formation of molecular hydrogen and thus the chemical origins of the Universe. “Thanks to recent advances in terahertz technology, it is now possible to perform high-resolution spectroscopy at the required far-infrared wavelengths,” explains Rolf Güsten, Lead Author of the article. 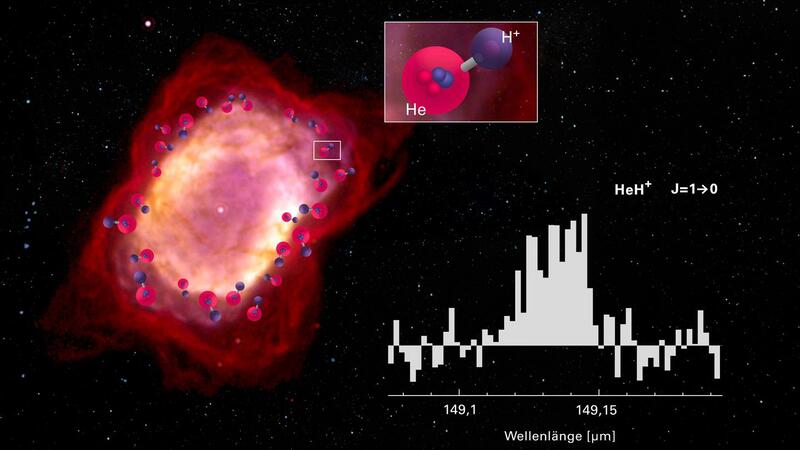 As a result of measurements performed using the GREAT spectrometer on board the SOFIA airborne observatory, the team can now announce the unambiguous detection of the HeH+ ion in the direction of the planetary nebula NGC 7027. The news broke that a railroad car, loaded with pure sodium, had just derailed and was spilling its contents. A television reporter called me for an explanation of why firefighters were not allowed to use water on the flames bursting from the mangled car. While on the air I added some sodium to a bit of water in a petri dish and we observed the vicious reaction. For further dramatic effect, I also placed some potassium into water and astonished everyone with the explosive bluish flames. Because Group I metals, also known as alkali metals, are very reactive, like the sodium from the rail car or the potassium, they are not found in nature in pure form but only as salts. Not only are they very reactive, they are soft and shiny, can easily be cut even with a dull knife and are the most metallic of all known elements. I am a chemist who spent his career building new molecules, sometimes using Group I elements. By studying the behavior and trends of Group I elements, we can get a glimpse of how the periodic table is arranged and how to interpret it. The arrangement of the periodic table and the properties of each element in it is based of the atomic number and the arrangement of the electrons orbiting the nucleus. The atomic number describes the number of protons in the nucleus of the element. Hydrogen’s atomic number is 1, helium’s is 2, lithium’s is 3 and so on. Each of the 18 columns in the table is called a group or a family. Elements in the same group share similar properties. And the properties can be assumed based on the location within the group. Going from the top of Group I to the bottom, for example, the atomic radii – the distance from the nucleus to the outer electrons – increases. But the amount of energy needed to rip off an outer electron decreases going from the top to the bottom because the electrons are farther from the nucleus and not held as tightly. This is important because how elements interact and react with each other depends on their ability to lose and gain electrons to make new compounds. The horizontal rows of the table are called periods. Moving from the left side of the period to the right, the atomic radius becomes smaller because each element has one additional proton and one additional electron. More protons means that electrons are pulled in more tightly toward the nucleus. For the same reason electronegativity – the degree to which an element tends to gain electrons – increases from left to right. The force required to remove the outermost electron, known as the ionization potential, also increases from the left-hand side of the table, which has elements with a metallic character, to the right side, which are nonmetals. Electronegativity decreases from the top of the column to the bottom. The melting point of the elements within a group also decreases from the top to the bottom of a group. As its name implies, Group I elements occupy the first column in the periodic table. Each element starts a new period. Lithium is at the top of the group and is followed by sodium, Na; potassium, K; rubidium, Rb; cesium, Cs and ends with the radioactive francium, Fr. Because it is highly radioactive, virtually no chemistry is performed with this element. Because each element in this column has a single outer electron in a new shell, the volumes of these elements are large and increase dramatically when moving from the top to the bottom of the group. Of all the Group I elements, cesium has the largest volumes because the outermost single electron is loosely held. In spite of these trends, the properties of the elements of Group I are more similar to each other than those of any other group. Using chemical properties as his guide, Russian chemist Dimitri Mendeleev correctly ordered the first Group I elements into his 1869 periodic table. It is called periodic because every eighth element repeats the properties of the one above it in the table. After arranging all of the then known elements, Mendeleev took the bold step of leaving blanks where his extrapolation of chemical properties showed that an element should exist. Subsequent discovery of these new elements proved his prediction correct. People have known since antiquity that wood ashes produce a potassium salt which, when combined with animal fat, will yield soap. Samuel Hopkins obtained the first U.S. patent on July 31, 1790, for soap under the new patent statute just signed into law by President George Washington a few months earlier. The pyrotechnic industry loves these Group I elements for their vibrant colors and explosive nature. Burning lithium produces a vivid crimson red color; sodium a yellow one; potassium lilac; rubidium red; and cesium violet. These colors are produced as electrons jump from their home environment orbiting the nucleus and returning back again. The cesium atomic clock, the most accurate timepiece ever developed, functions by measuring the frequency of cesium electrons jumping back and forth between energy states. FOCS 1, a continuous cold caesium fountain atomic clock in Switzerland, started operating in 2004 at an uncertainty of one second in 30 million years. Clocks based on electrons jumping provide an extremely precise way to count seconds. Other applications include sodium vapor lamps and lithium batteries. In my own research I have used Group I metals as tools to perform other chemistry. Once I was in need of absolutely dry alcohol, and the driest I could buy still contained minute traces of water. The only way to get rid of the last remnant of water was by treating the water-containing alcohol with sodium – a rather dramatic way to remove water. The alkali elements not only occupy the first column in the periodic table, but they also show the most reactivity of all groups in the entire table and have the most dramatic trends in volume and ionization potential, while maintaining great similarity among themselves.